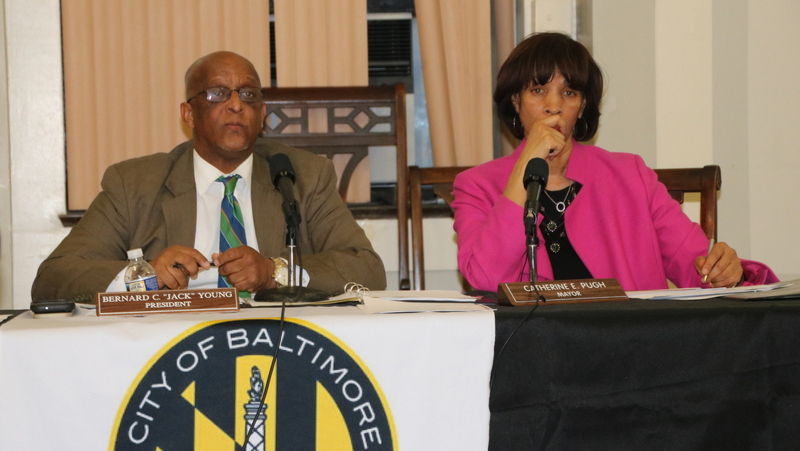 Unlike “Taxpayers’ Night” events held back in the Rawlings-Blake era — only one person showed up to testify in 2014 and the ex-mayor scooted out of the room early in 2016 — last night’s was well-attended. And it was witnessed until the end by Mayor Catherine Pugh and the rest of Baltimore’s Board of Estimates. 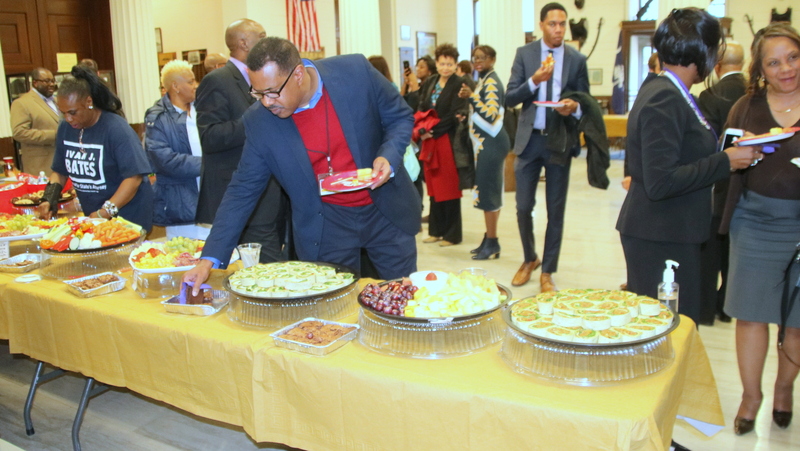 Some of the attendance may have been due to the presence of high- and mid-level city officials in the audience as well as the array of free food, drinks and live music in the War Memorial Building lobby. The city’s 2019 spending plan, they said, is “an apartheid budget” that showers too much money on police. “Study after study shows that a living wage, access to holistic health care services and treatment, educational opportunities and stable housing are far more successful at reducing crime than police or prisons,” said Nabeehah Aziz of Communities United. She and others decried the Police Department budget – slated to rise 2.8% from $497 million to $511 million (not counting unbudgeted overtime) – and charged that the category where the city spends the most is the least effective. “If policing and incarceration worked, Baltimore City would be the safest city in the country,” remarked Communities United’s Thomas Dargan, drawing laughs from the crowd. Cited in addition to last year’s record-high murder rate were other bad headlines for the police force, including the misconduct by police officers exposed in the federal Gun Trace Task Force trial. 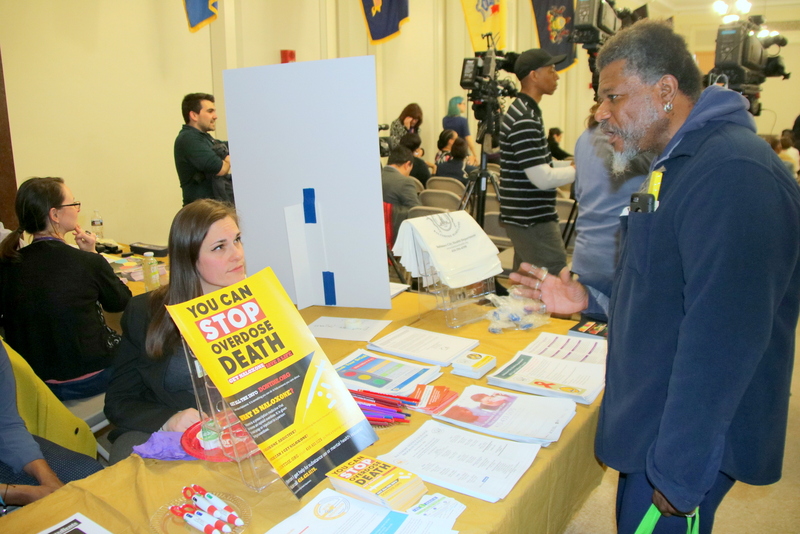 “It’s a pity that despite the murders and corruption in BPD you still see a need to invest in them,” said Morgan State University associate professor Lawrence Brown. 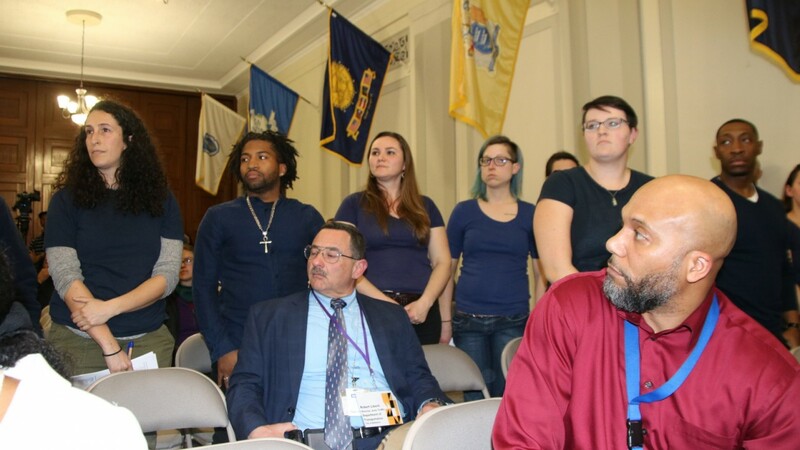 Brown pointed to a group of people in the audience dressed in navy blue standing up to represent city police spending and a much smaller group that stood up to represent such spending categories as health, housing, arts and parks. “We spend more per capita on police than any city in America – that’s amazing,” said city resident Todd Ferguson. 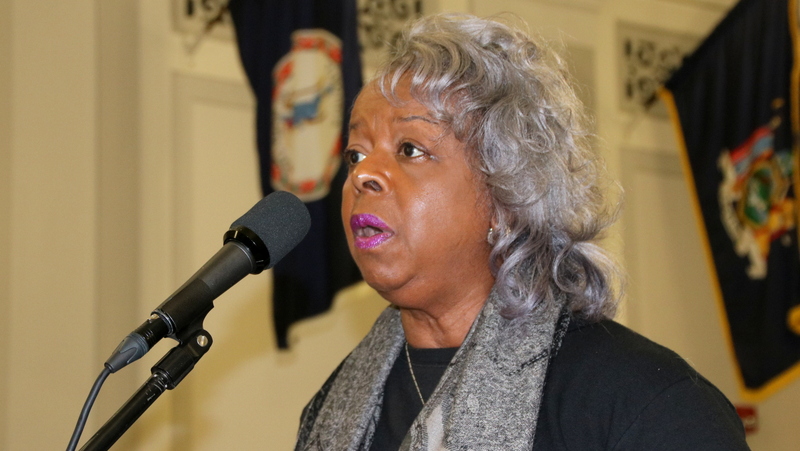 Others echoed those themes, even as they brought more focused neighborhood issues to this annual public sound-off session on Pugh’s proposed $2.8 billion annual budget starting on July 1. Under the spending plan (and with a tax break dating back to the previous administration), the average owner-occupied home will pay $2.07 per $100 of assessed value. The city’s overall property tax rate of $2.248 per $100 of assessed value remains more than twice that of surrounding counties. Many of the residents who spoke complained that despite the taxes they pay, they receive poor city services. “It’s true my concerns are small compared to some that I’ve heard tonight,” said Charlene Bradley, of the Brighton community in northwest Baltimore. “But I’m hyped and on fire about this because I’ve been battling so long and my neighbors have been battling for so long to get some help and assistance,” Bradley said. She reeled off a list officials going back to 2010 who had promised – and failed – to help with chronic bulk trash dumping problems and blind intersections that need speed bumps to slow traffic. Her most recent complaint, a February 7 call to the city’s 311 operator, was closed out the next day as if the bulk trash mess had been removed. “It hadn’t been touched,” Bradley said. A bitter Phillip Bass, of the Allendale neighborhood in southwest Baltimore, recounted his decade-long campaign to get a playground and refurbished basketball court at the Mary E. Rodman Recreation Center. “It seems like my tax dollars are going every other place except my community,” he said, noting that he has been living at the same house since 1958 and paying taxes there since 1986. 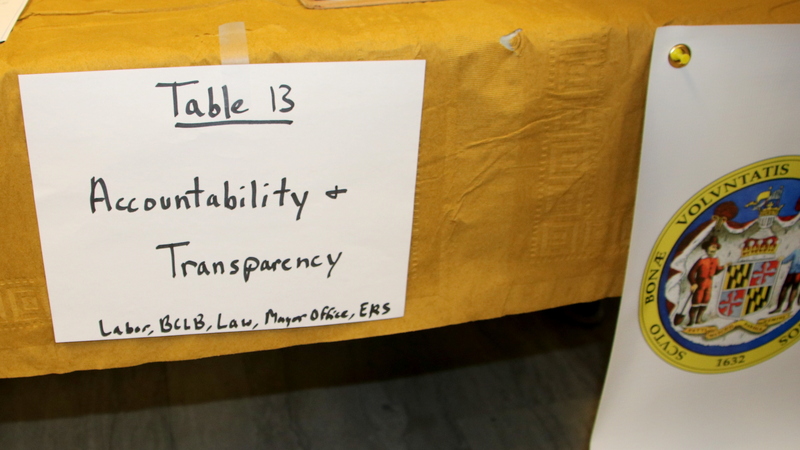 By tradition at Taxpayers’ Night, board members, including the mayor, do not address the room or answer questions posed to them by citizens. Neither do city officials, with the exception of budget director Robert Cenname. But that didn’t stop speakers from singling out individual officials specifically, and sometimes bitingly. 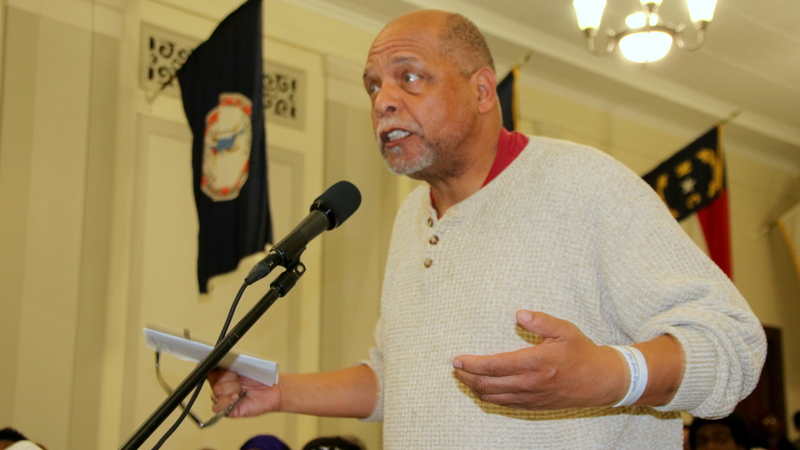 But perhaps the most stinging remarks to turn personal came from housing activist Anthony Williams, who called on the spending board to put money into the Affordable Housing Trust Fund. Midway through, he directed his comments at City Council President Bernard C. “Jack” Young. Young, who chaired the meeting, and the other members of the board listened as Williams concluded and the next speaker came up.